Stockholm is the capital of Sweden. In their tourism website, they self-claim their city as “the capital of Scandinavia”, though maybe people from Copenhagen won’t feel too happy about that claim. This post is the third and final part of my series on exploring Scandinavian cities (Copenhagen, Oslo, Stockholm). I arrived in Stockholm at nice evening after a day of exploration in Oslo. The airport’s name is Arlanda, it’s located a bit far from Stockholm city. There are few options to reach Stockholm: Arlanda Express train, Flygbussarna bus, regular buses and taxi. Arlanda Express costs SEK 260 for a single trip and SEK 490 for a return trip, travel time is around 20 minutes. Flygbussarna costs SEK 119 (one trip) or SEK 205 (return). These prices are accurate at the time of this writing. A Stockholm Card will give unlimited access to public transport and free access to more than 80 museums. However, it does NOT include Arlanda Express and Flygbussarna. We can go from Arlanda airport to Stockholm city using regular bus or commuter trains (which are included in Stockholm Card), but visitors carrying suitcases won’t find it easy. I was happy with my decision to buy Copenhagen Card and regretted not to buy Oslo Pass, so I bought Stockholm Card. It costs SEK 525 for 24 hours, SEK 675 for 48 hours, SEK 825 for 72 hours and SEK 1095 for 120 hours. The validity period starts when we use the card for the first time. Finding the way to Arlanda Express platform was reasonably easy, thanks to sufficient bilingual airport signs. When I reached the platform, one Arlanda Express train just departed, so I had to wait around 10 minutes for the next one. The journey was enjoyable. The train has special location for us to put our baggage so we can sit comfortably. Our seats had power outlet so we can charge out gadgets, very useful. Since it was summer in Sweden, sunset was around 10 pm (or even later) so the city was still pretty much bright. The city was lively, but not to the point of overcrowded. Just like Copenhagen and Oslo, I quickly noticed a lot of nicely preserved old buildings, giving the overall classic feeling to the city. I don’t need to buy any local SIM card for Sweden because I already had one. I ordered Comviq SIM card from an online store, before I traveled. The SIM card was delivered by post to Australia and I received it few weeks before my flight to Scandinavia. So I have Internet connection as soon as I arrived at the airport. For around AUD 8.60 I can get 1 GB data, which I think is a good price. First issue, I couldn’t find my hotel. There was no hotel at the location pointed by Google Maps based on the address that I entered. It was a shopping street. Then I checked Apple Maps and finally found the right location. Google Maps pointed a location one block away, causing me to drag my heavy suitcases to a crowded shopping street. It was a tiring day. So I checked in to the hotel and quickly went out to grab a quick dinner at McDonald’s. Most other food stores were closed already. After a good night sleep, I was ready to actually start my exploration day in Stockholm. As I previously planned, I woke up in the morning and took public transport to Djurgården island. Stockholm has trams too ! Yay for cities with trams (from someone feeling proud of tram network in Melbourne city). Basically tram route 7 will take us to various museums in Djurgården. My initial first destination was Nordiska Museet (Nordic Museum). No particular reason for choosing this museum as my first destination other than it’s the first museum I can find from the stops of tram 7. Apparently I was too early and the museum was not opened yet. So I took a quick photo from the outside, then walked towards another destination: Vasamuseet (Vasa Museum). 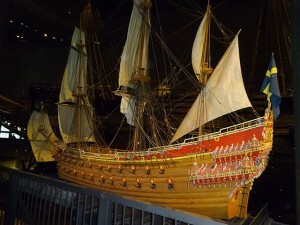 Vasa Museum is a maritime museum where we can see Vasa ship, an amazing warship from 1628. The ship is huge. So huge that they need to build a six levels museum to allow visitors to admire the ship from different angles. And I felt so stupid that I have climbed stairs 5 times to explore every floor, only to find out later that they have elevator. I was impressed with the ship and the fine details of sculptures that it had. On every floor, they have other exhibits related to the ship. They analyzed the remains of the ship under microscope and figured out what most likely to be the color of each part when the ship was still active. Based on these color pattern, they created the mini version of the ship, colored based on their analysis. I can at least tell you that a ship from 1628 was more colorful that what I originally thought. From Vasa Museum, I went back to Nordiska Museet and entered the museum. This is where we can find a giant sculpture of King Gustav Vasa, the Swedish so called founder-king. They have other exhibits in the museum. While those other exhibits were not bad, I still think the only one worth mentioning is just the giant sculpture. The building structure of this museum is a bit different from most other Swedish buildings. It was influenced by Dutch-influenced Danish Renaissance architecture rather than original Swedish architecture style. Still in Djurgården area, I continued my journey to Skansen. This is a huge open-air museum. Since I got myself a Stockholm Card with free access to these museums, I did my best to make sure I got my money’s worth. Upon entering Skansen, I was welcomed by a really tall escalator. The main exhibitions were located up high from the entrance gate. After the escalator, I still have to climb even higher to reach the main area of the open museum. they have various buildings there, from the ancient houses (that pretty much look the ones in Norsk Folkemuseum) to “more-modern” ones with red painting and white frames. We could enter some buildings to see some indoor exhibitions. Since the area was seriously huge, every few block they had places we could sit down and ordered some food or drink. Some of the visitors are clearly tourists, but I also saw a lot of locals coming to this museum with their kids. I spent few hours in Skansen, before finally considering to go out because I was hungry. Before I finished walking towards the exit, suddenly it was raining pretty bad. All the restaurants inside the museum area are fully crowded with visitors avoiding the rain. I brought an umbrella, so my issue was more about feeling hungry rather than avoiding rain. I checked few places they were all full. Then I went down the escalator near entrance gate, then realized they still had yet another restaurant there. And this restaurant was empty. Only few people in it because everyone else was so focused on restaurants above the escalator. Lucky. I enjoyed my lunch peacefully there. Next I went back to my hotel to refill some drinking water. Tap water is safe to drink in Sweden and bottled water at tourist locations costs around USD 4. Well, I still bought bottled water several times to avoid dehydration. But since the route to my next destination included a stop near my hotel, I figured I might as well did a short return to freshen up myself. I took subway train towards Gamla Stan (Old City) area. Actually the streets of Gamla Stan itself was a location very worthy to explore, but that was not my plan for that day. I went straight to Storkyrkan (Stockholm Cathedral), entered the building and was impressed with beautiful gold-themed interior. And I’m glad that entrance ticket is also included in Stockholm Card. Just right next to Storkyrkan is Kungliga Slotted (The Royal Palace of Sweden). It was a beautiful palace with gorgeous exhibits inside (including some crowns), but unfortunately taking photos were not allowed inside. I entered from South entrance and finished at North entrance. 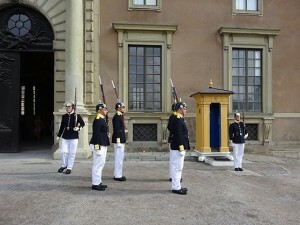 Similar to Oslo Royal Palace, I found standing guards at the North entrance of Kungliga Slotted. Apparently one of the working shift of a guard is over, and I happened to witness an interesting small “ritual”. Five men on guard uniforms (4 in front plus 1 behind) were coming towards the guard ending his shift. The new guard was the one behind the formation. So 4 guards are “delivering” replacement for this guy, while he left his post following those 4 “delivery guards”. From the North entrance of Kungliga Slotted, we can see amazing view to Parliament building. I walked towards the Parliament building and took a photo there. Again, few people noticed my unique camera tripod and made funny comments. Actually this parliament building is located in a small island separated from Gamla Stan and Stockholm city area. Thanks to excellent road (and bridges), it almost felt like it was located on the same island. There was another museum just in front of Parliament building: Medieval Museum (Stockholms Medeltidsmuseum). It has collection of historical objects from medieval era. My last target for the day was to visit IKEA Kungens Kurva. 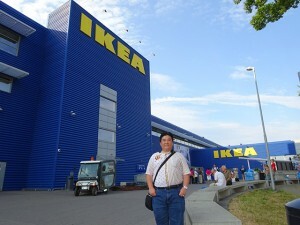 I bought some of my home furniture from IKEA and I thought visiting Sweden is not complete without visiting IKEA. I read that IKEA Kungens Kurva is the largest IKEA store in the world, so I decided to find a way to visit it, even though it’s rather far from Stockholm city. It took me around 1 hour (by bus, train and bus again) to reach there. And all I did was to have dinner, enjoying salmon and Swedish meatball. Then I returned to my hotel with happy tummy. Most train stations have bus stop nearby and they appear as the same spot in Google Maps. For some stations, the location of bus stops were obvious and easy to find. However, for some stations, I was confused and took me more than 15 minutes just to find the bus stop location for that train station. My second day of exploration started with taking a boat tour. 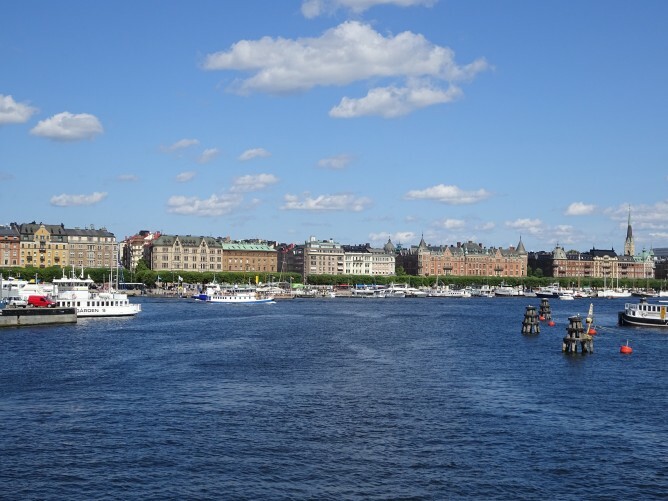 Stockholm Card includes two options of boat tour: Historical Canal Tour and Royal Canal Tour. These two tours took different routes, so visitors will see different buildings and hear different stories. Too bad that they only allow us to choose one. We need to pay extra for the other one if we want to see both. I chose Historical Canal Tour because Royal Canal Tour basically goes around Djurgården, and I had spent half day exploring that area, so I hoped to see different view from the other route. Historical Canal Tour started at Stadshusbron. The tour itself was good and we got to hear some interesting (recorded) stories. However, I was disappointed because the boat window was dirty and I couldn’t get decent photos of those great views that I saw. I think they should put more effort in making sure their boat windows are clean so visitors can get the best possible photos they deserve. The next destination is Stockholm City Hall, which is located right next to Stadshusbron. To enter the building, we need to take compulsory guided tour. It’s free from Stockholm Card, but we need to wait for scheduled time. They have different schedules for guided tour conducted in various languages. I happened to wait around 5 minutes for an English-speaking tour at noon. My tour guide was amazing by the way, she spoke her introduction in 6 languages, making sure that everyone knew which group to follow, according to their languages. 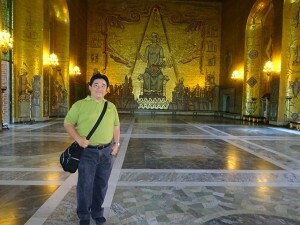 Inside Stockholm City Hall, I saw the room that is used for the annual Nobel prize banquet. It was a pretty small room. And as the tour guide explained, it does get very packed at the banquet with so many people attending. Surely they can find a better location for the banquet? But perhaps they try to keep the location to preserve its historical value. Most other rooms are typical Swedish-style classic building. There was a strikingly different room that got me impressed. The room is decorated with Indian-style ornaments, its walls are gold-colored from small tiles made from glass and real 24k gold. Thanks to the advanced technique in making those tiles, such a huge room is covered by cold-colored tiles using “only” less than 20 kg gold. 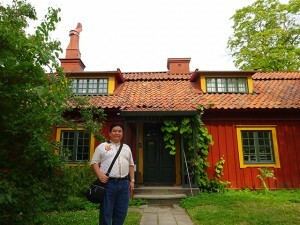 My initial plan for the next destination was to visit Swedish National Museum. When I arrived there, the museum was closed for renovation. They announced that they have temporary exhibitions at Konstakademien, but only showing part of their usual collection. I decided to go there anyway. Indeed there was not much on display there. Got to see few interesting art objects, but was expecting more. Had lunch at a small cafe in Konstakademien, then headed back to Djurgården island to visit Prins Eugens Waldemarsudde. From the booklets that I got, it seems like a nice place with classic furniture nicely preserved in a mansion. I was partly right. It did have few rooms with classic furniture, but the rest are modern art display. They weren’t bad, but I think those brochures were kinda misleading. Especially that I need to walk around 20 minutes from the nearest tram stop to the museum building. It was not worth it, at least for me. 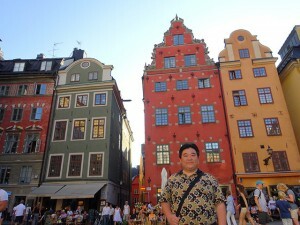 Then I went back to Gamla Stan Area. This time, not to visit particular building, but to enjoy the area in general. I got a French hotdog and ice cream there, yum! Took a photo in front of Nobel Museum, but decided not to enter (which I regret later). 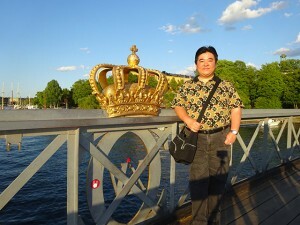 With the remaining energy that I had left, I continued the journey to Skeppsholmsbron bridge to take photo with the iconic Gilded Crown. It’s basically a big crown attached to a bridge. Or, maybe I should mention that both sides of the bridge had one. So there were two of them. Being placed outdoor for so many years, naturally the “crown” was a bit torn when observed from close distance. However, it still looked great as a photo object from sufficient distance. Apart from the crown, the view from that bridge was magnificent. It was one of the best viewing spot I got so far in Stockholm. For the last itinerary of the day, I planned to visit SkyView, an attraction that takes us to the top of the world’s largest spherical building, the Ericsson Globe, a Stockholm landmark. I managed to get there around 1 hour before they close. And they still accepted new visitors. But when I tried to enter, showing my Stockholm Card, they said there was no more seat for 1 person group. So I was rejected. Disappointed, I just took a quick photo outside the building and head back to the hotel. Even one planned activity was not accomplished, overall exploring Stockholm was a quite enjoyable journey. Love the city, love the fresh air (even though the summer sun is too hot for my liking), love the spectacular view of the city divided by water. This ends my quick exploration in 3 Scandinavian cities.